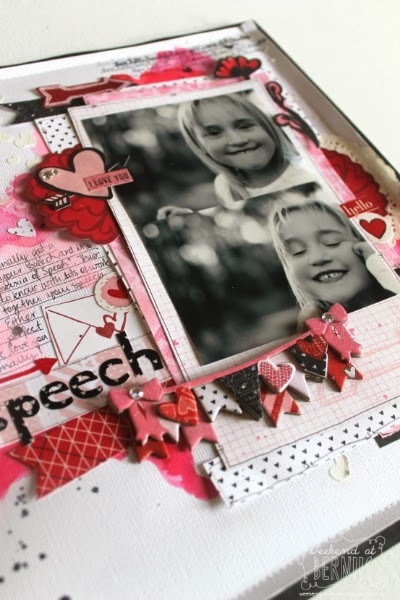 We continue our week of LOVE themed projects with a couple of lovely layouts by Bernii and Megan. 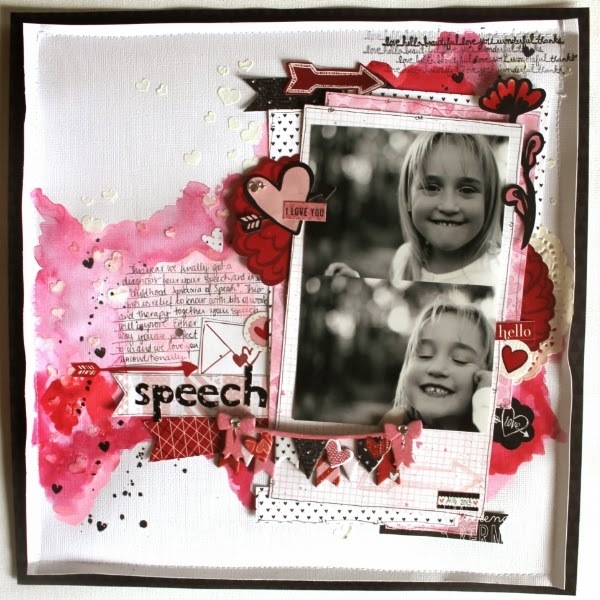 Bernii's layout features the one element she loves about her daughter and Megan created a layout as a tribute of love to her late Uncle. Both of them are exactly what love is all about! 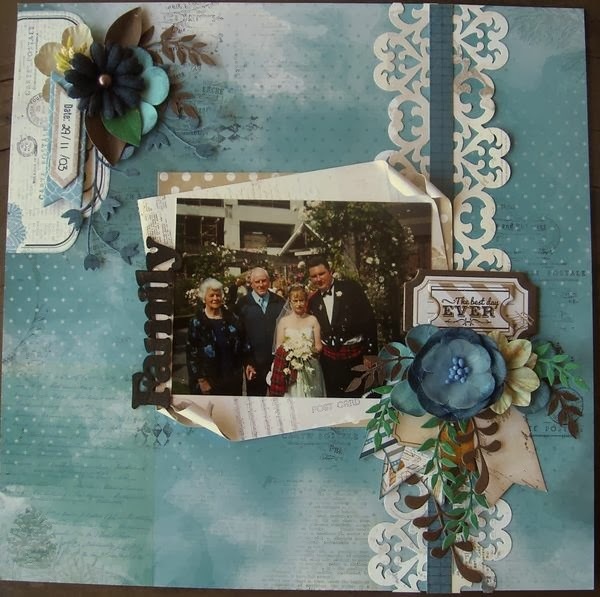 This is a fun layout I created using the Head Over Heels collection. Instead of creating with the expected "love" pictures, I decided to focus on an element I love about my daughter -- her speech. She has a speech impediment which makes her unique and I love her unconditionally for her imperfect, perfectness! This collection, which is full of love and all things girly, was the perfect collection to help represent my feelings for her. 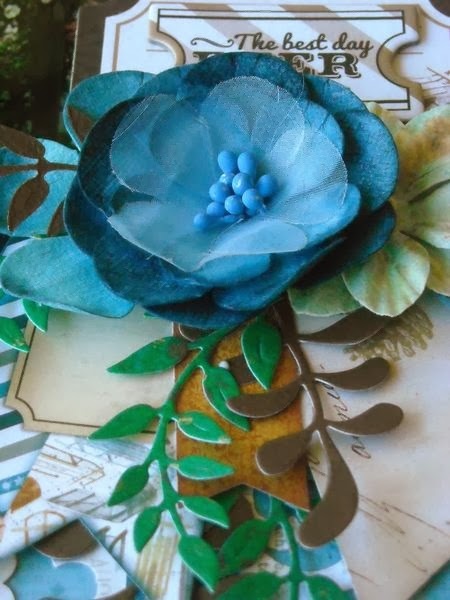 Watercolours are a hot trend right now in scrapbooking and I am totally in love with this technique. I find that using a few different colours help add depth and interest as well as help to pick up the different colours found in the patterned papers. 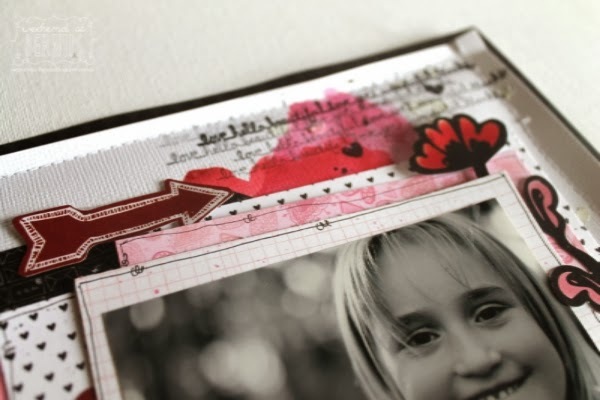 I love to layer, and using the 6 x 6 Head over Heels paper pad is a perfect way to add little pieces of paper to create the layered look. I hope that I have inspired you to pull out your Head Over Heels collection and to play. The one thing I noticed was look at how they are holding hands! I love it, still so in love after all these years - I hope we are just like that :) The other thing I see is that I don't look particularly happy, when really its my wedding day so I should be beaming! But this was the end of day of photos, I was tired and my mother in-law had refused to come and I think that by this point I was still trying to hold it together. I used the wonderful warm tones of the Woodland Winter Collection. Blue is one of my favourite colours, so I am a bit biased. I also wanted to show how easy it is to change the theme of a paper range to suit the context of your photo. To help keep the focus on my Aunt and Uncle, I focused on the blues in my aunts dress. This helps detract from the white of my dress and the red from our Stewart tartan. 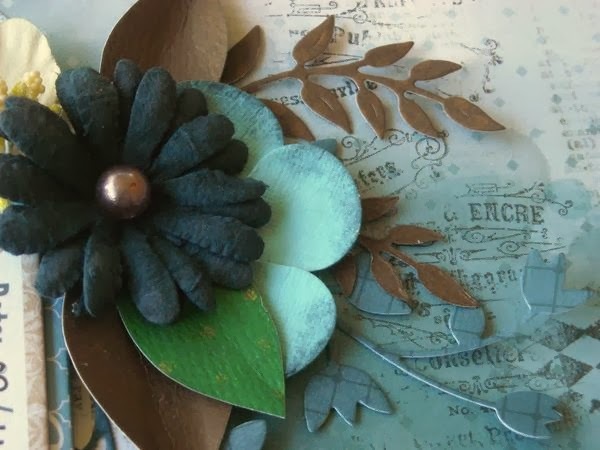 I also altered the background paper using various stamps. Instead of adhering the stamp to a stamp block, I stamped by holding the stamp with my fingers. This gives the images a more distressed and random look. BOTH are precious pages - thank you for sharing your LOVE!!! <3 both layouts. Bernii's watercolours, and Megan's choice of paper. Well done, ladies! Such beautiful layouts. I love how you each showcased Love in your own styles and designs! They are both such beautiful lay-outs full of love! 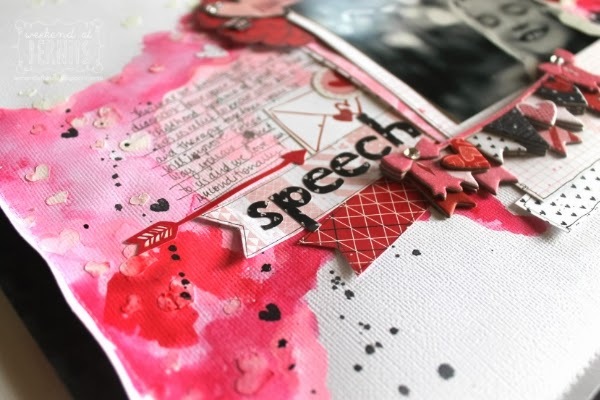 I love how you both used different collections for creating a romantic lay-out.